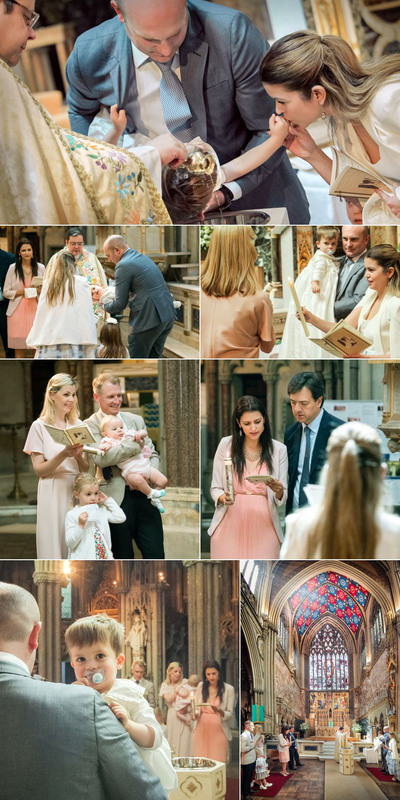 Our day as christening videographer and photographer at Kieran’s baptism was a fun and lively. The cute and engaging toddler received the holy sacrament at the Church of the Immaculate Conception, also known as Farm Street Church, in Mayfair in the heart of London. It is not a church I knew well before Kieran’s baptism, but I am pleased to now be more familiar with it as it is a lovely building with beautiful features. It is unusually decorative for a Roman Catholic church in London with its brightly painted ceiling, stained glass windows, ornately carved altar and magnificent Gothic Revival features. Although the service took place on a sunny afternoon, I think Farm Street Church would also be a fantastic backdrop winter wedding, with the sunlight streaming through the stained glass to cast jewel coloured shapes on the floor, and candles highlighting the exquisite relief carving on the pews. The church also has a very welcoming atmosphere that puts everyone, even non-churchgoers, at ease. As is customary in most cultures, Kieran wore white to represent purity. The pleasant spring weather lent itself to outdoor photos, and I got some touching shots of Kieran and his father playing outside after the service as well as some nice photos of him with his parents and sister, and godparents and their families. Photographing children can be unpredictable enough, so it is essential to have as many aspects of the baptism photography as organised as possible. While I always have a backup location in case of poor weather, I am very grateful when the day is fine, and we do not have to rely on Plan B! After the service and group photos, the happy group walked to the nearby Punchbowl. Built in the mid-1700s, it is one of the oldest pubs in Mayfair. Kieran was delighted to have a little more freedom, and I love the photos of him strolling along in his white sailor suit and hat. Kieran’s parents had booked a private dining room at the pub for the celebrations. The unfussy yet stylish space was ideal for the special family celebration which included an impressive three-tiered cake and gift bags for the guests. Kieran’s outfit was changed for something more appropriate for a toddler to wear while eating, the next few hours were full of delicious food and happy chatter. The Punchbowl has an excellent reputation for the quality of its gastro-pub food and cask ales, and it certainly lived up to its good name. The staff were courteous and friendly and ensured no one was left waiting for food or drink – a must when there are young children involved. It certainly made my job easier as there were happy faces all around. Kieran’s parents did a fantastic job of making sure guests felt relaxed and happy. By providing entertainment for the children in the form of goody bags, Play-Doh and face painting, they allowed the children’s parents to eat and socialise without distraction. It was clear that they put much thought into making sure that not only Kieran but everyone present was able to enjoy the day.